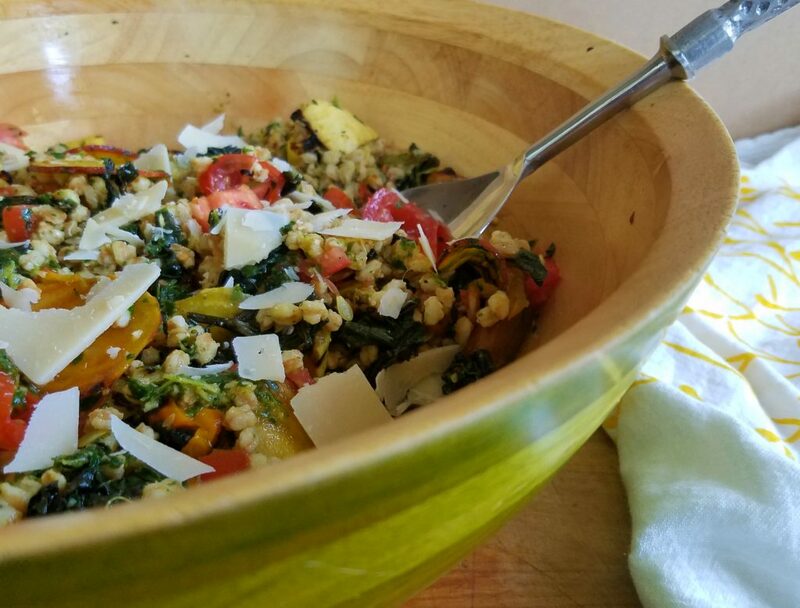 In this brightly colored dish, farro is tossed with a fresh herbal persillade then mixed with an assortment of grilled and raw summer veggies. 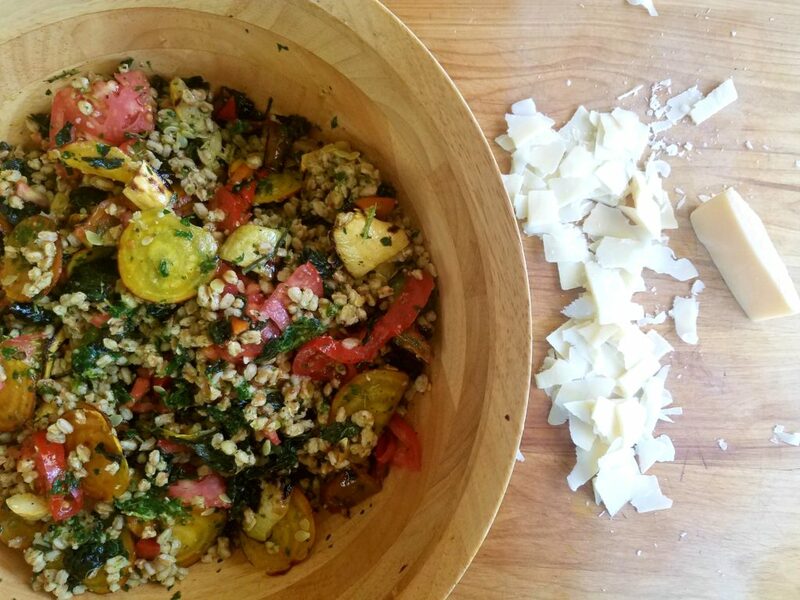 It’s a perfect-for-summer dish that works as well as a barbecue side as it does a vegetarian main course. Last week with only a few hours left before our monthly wine club dinner, I realized I hadn’t yet come up with a dish to take. The theme this month was centered on wines from islands around the world and the hosts were serving up a shrimp boil as the main course (which turned out to be delightfully spicy and a perfect accompaniment to the wines). Our wine club get-togethers are always a feast; we are fortunate to have lots of good cooks in the club and each month there is a wonderful array of delicious dishes, albeit not always the most healthful! 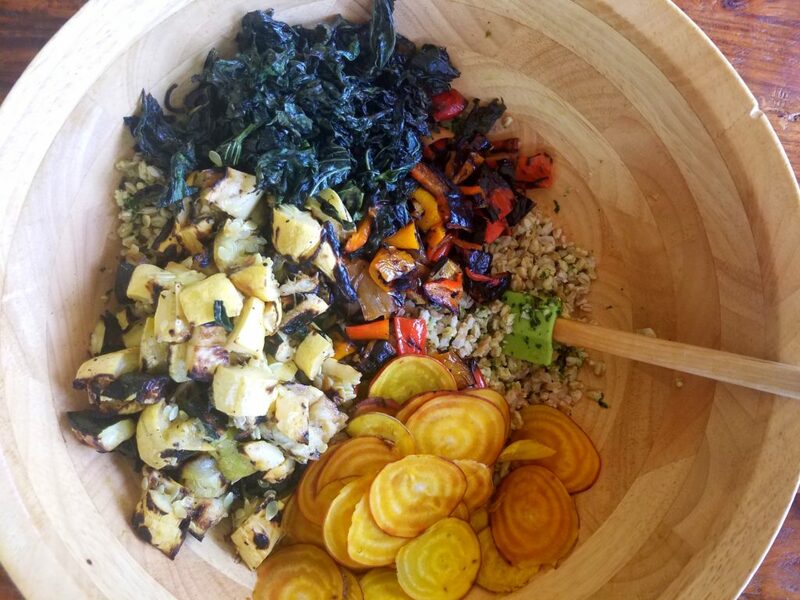 While I definitely indulge in these tasty dishes, I always try to bring a healthful dish to share. Standing in my kitchen pondering what I could make with what I had on hand, I decided I wasn’t in the mood for a salad. 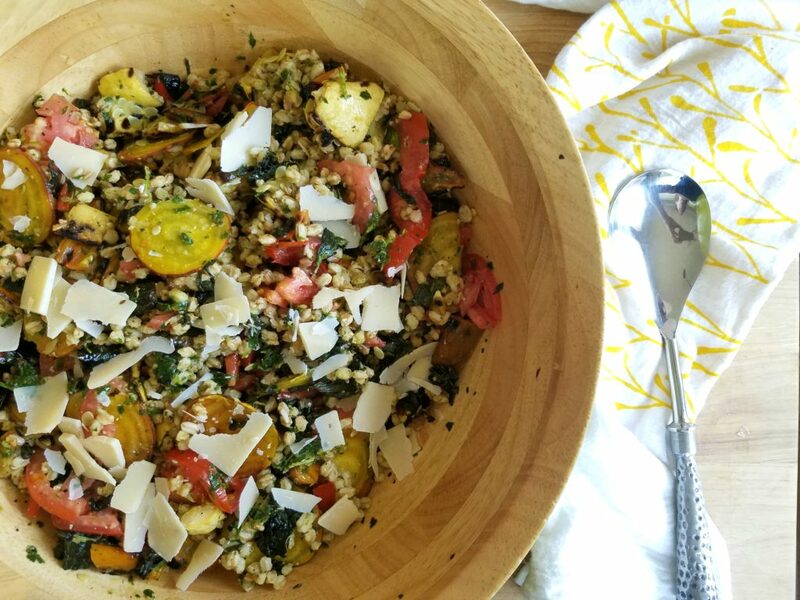 Then my eyes settled on a bowl on the counter which was overflowing with an assortment of just picked squash, peppers and tomatoes and I realized I’d found my starting point. 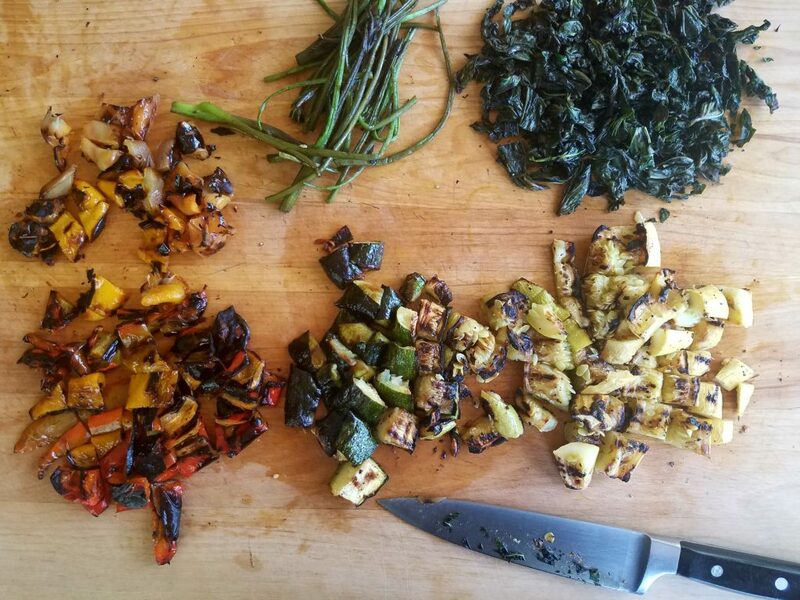 I tossed the squash and peppers on the grill along with a bunch of sweet potato greens I’d found in the fridge- doing their best to stay perky in a jar of water. While the veggies were on the grill getting their suntan burn on, I made a French persillade with parsley, garlic, olive oil, lemon and a few sprigs of cilantro. A persillade is a sauce made of parsley blended with other herbs, garlic, oil, and vinegar or other acid. Similar to a pesto but without the nuts or cheese, it’s probably closest to a chimichurri without the oregano. Since I was a little pressed for time I was happy to find a container of leftover farro in the freezer. 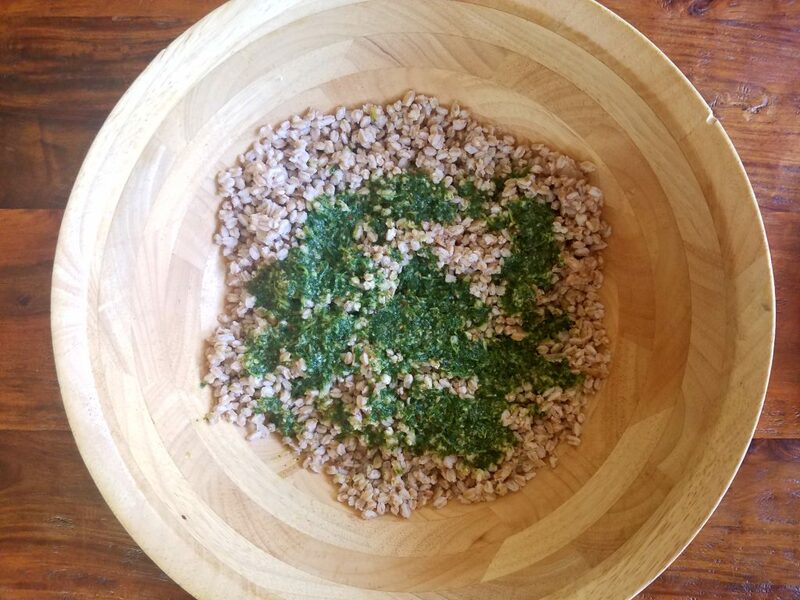 If you don’t already do this, it’s a great idea when making farro or other grains like quinoa or rice, to make extra and freeze it for times just like this. 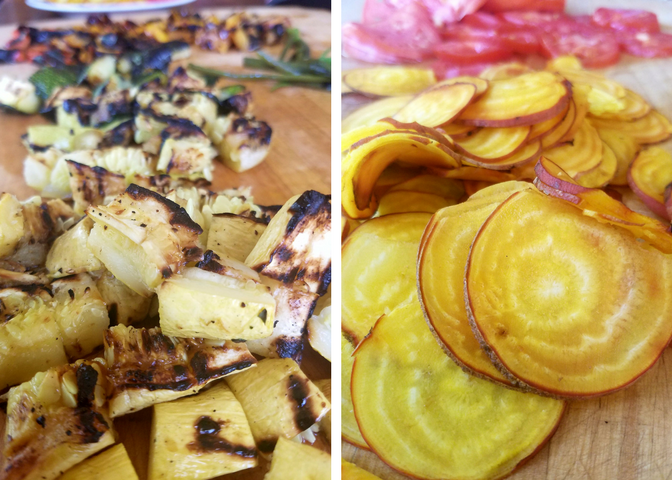 I like the idea of combining cooked and raw vegetables for the extra nutritional boost, so I thinly sliced the tomatoes and some beautiful golden beets I found lurking in the back of the crisper drawer and added these at the end. A scattering of parmesan cheese over the top brought this dish home. Had I had more time I might have lightly toasted some nuts to sprinkle on top as well – it didn’t really need it but this would be a nice trade for the parmesan in a vegan variation. Feel free to use any combination of summer vegetables here, I simply used what I had on hand. I left the stems on the sweet potato greens while grilling for easier handling but cut them off and only used the leaves in the final dish. The stems were a bit tough and have an earthy, grass-like flavor that I don’t mind but thought others at the party might. This dish is best served at room temperature. It can be made ahead of time and stored in the refrigerator, just bring it out and let sit for about an hour before serving. 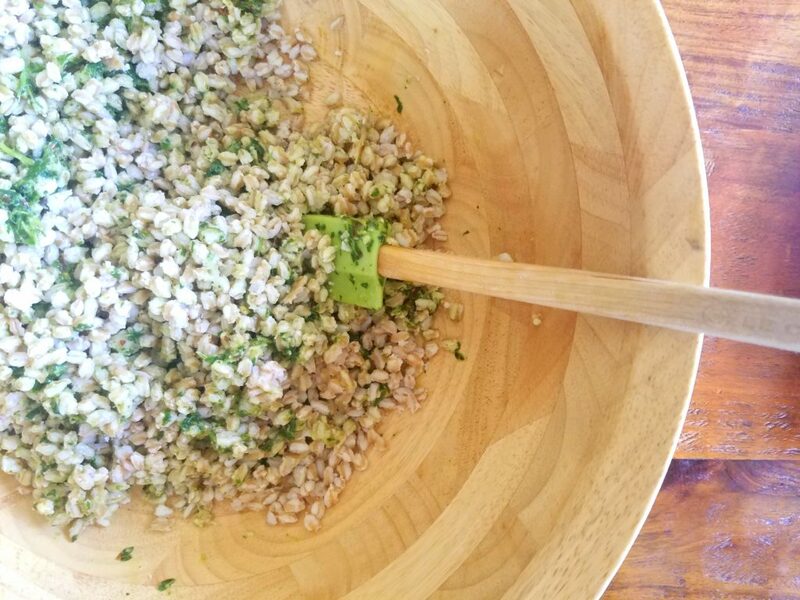 To cook the farro: rinse and drain 2 cups farro, place in a pot and add 6 cups water. Bring to a boil; reduce heat to medium-low and simmer 30 minutes. Drain off any excess water. Heat grill to medium high. Put the peppers and squash in a large bowl with most of the grapeseed oil and toss to coat, sprinkle with salt and pepper. Remove and repeat process with the greens, careful to keep them together as a bunch. 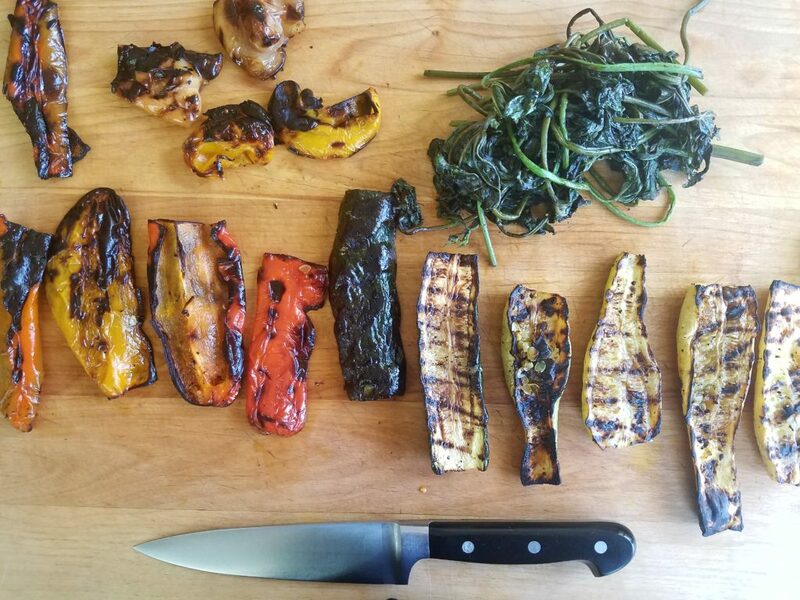 Grill peppers and squash until charred, about 4 minutes per side. Lay the greens on the grill in a bunch, cook 1-2 minutes then, using tongs, turn the bunch over all at once. Continue to cook another minute. 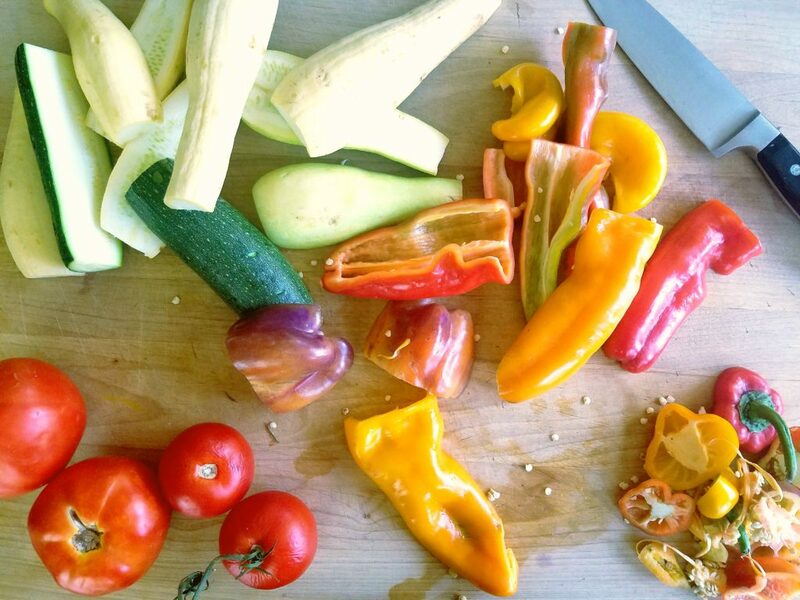 Let vegetables cool enough to touch and roughly chop. Set aside. 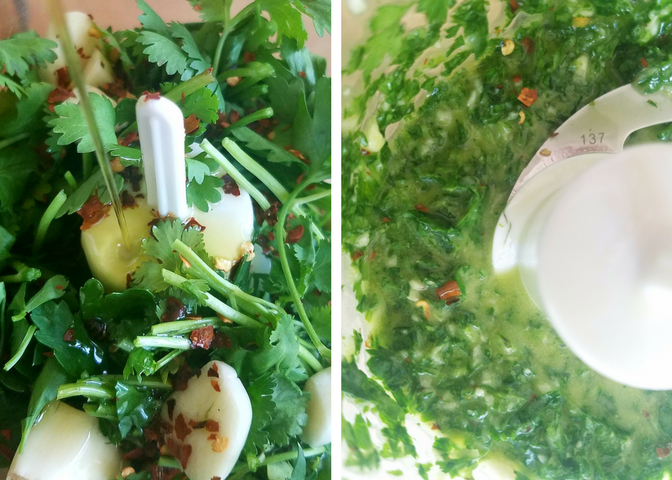 To make the persillade: Put the parsley, cilantro, garlic, red pepper, salt, lemon juice and olive oil in a small food processor or blender and pulse or blend until combined. Adjust salt, lemon juice or olive oil to taste. Add the persillade to the cooked farro and toss to combine. Add the grilled veggies and beets and stir. Add the tomatoes and toss lightly. Scatter shaved parmesan on top. What a great idea to take to a summer evening get together! Thanks Michele! If you make it please let me know what you think! I’ lucky enough that I’ve had this fabulous dish twice already. I made it just after you posted it, and I raved about it so much that my daughter made it and invited me over for dinner! I think I see it on the menu next week again. Delicious!